a. We are allowed to carry/haul up to 10 tons in a roll-off box by State Law. Over 10 tons is illegal and can carry extremely stiff penalties and fines for being severely over weight. 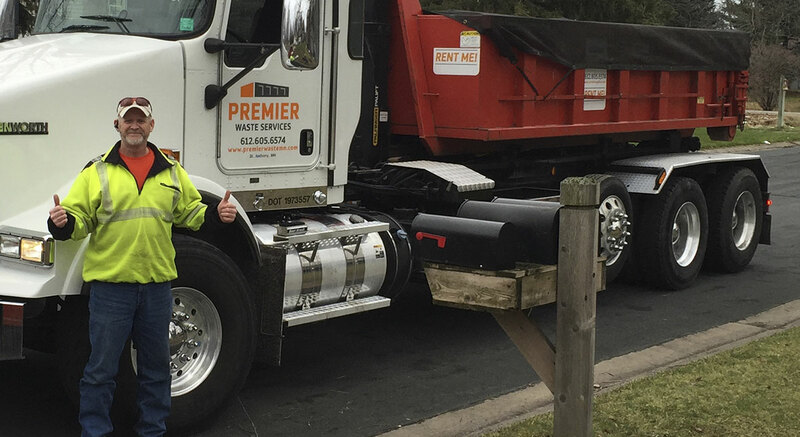 While our drivers are very good at estimating the weight of a dumpster, we simply cannot afford to take the risk of hauling overweight loads. The MNDOT can go back and issue overweight citations based on scale tickets alone and not necessarily being weighed on the street. If a driver determines that a load is overweight, it will have to be unloaded to a safe and legal payload before we will haul it. b. Those loads that are hauled and exceed 10 tons, will be surcharge at a rate of $50.00/ton over the 10 ton legal limit. c. Roll-Off boxes are to be loaded level full. We know that this is not always the case, and we accept this as part of the job. But, when a dumpster is grossly overloaded and unsafe to haul due to height restrictions or merely the fact that our mesh tarps cannot keep all of the overloaded materials in the dumpster, we will have no choice but to wait until enough materials are offloaded and the dumpster is at a safe load level to haul. d. Dumpsters are delivered and placed on a job site so that we can easily access them when time comes to remove or exchange them out. PLESE DO NOT move the dumpsters on your job site without our permission. Dumpsters have gotten damaged, turned around, and made inaccessible for us by being moved. If a dumpster is damaged and in need of repair while in your custody the cost of repair will be passed along to you. a. You are responsible for the contents of the load. The dumpster delivered to your job site is under your care and custody. If your load is dumped and found to contain Television, Appliances, Mattress/Box Spring, etc. you will be charged accordingly for these items. b. If we are asked to service a customer (delivery, exchange, removal, etc.) and that service is not able to be competed due to reasons other than PWS fault (blocked by car or returns, wrong address, overloaded/overweight dumpster), then a $150.00 trip charge will be charged to cover the cost of the truck time, fuel and driver expenses. c. Please be aware of the DOMINO effect – if we have excessive wait time (cars have to be moved, container blocked, shingles being unloaded, etc.) then this becomes a domino effect and we will be late for schedule services the remainder of the day. When dispatching, we try to account for traffic, weather, etc. as much as we can, but sometimes there are extenuating circumstances that are beyond our control. a. We will place the dumpster at the customer's direction. Please be aware that we will take every precaution within reason to make sure that we do not damage any property, but we cannot be responsible for damage caused by the weight of the truck, the weight of the dumpster or damage due to the dumpster being placed on less than a solid surface, such as grass or loose fill. Many driveways today are simply not constructed to handle the weight of a large truck. In non-winter months we put wood underneath the dumpster to protect the surface of the driveway, but if it is a hot day and the dumpster is filled with heavy materials (such as shingles or concrete), there is no guarantee that the boards may not leave an impression in an asphalt driveway. PWS will not assume any liability for damage to any surface when the container was properly placed and removed at the customer's direction. Payment terms are listed on your invoice. Because of an abuse by some, in 2016 will begin to charge finance charges of 1.5% per month or 18% on an annual basis for those accounts that are considered past due (more than 30 days past due date). Those accounts that reach 60 days past the due date are considered delinquent and services will be suspended and collection and/or legal action will be taken at the customer's expense.